The Requirement: The customer required a stainless steel enclosure that would fit snug around an existing compressor and motor package. 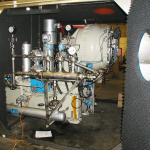 The enclosure would have to contain mounting holes that could easily be accessed in an area of tight confinement around the compressor package. The customer also required a pitched roof, (4) easy-access doors, stainless steel hardware, mounting brackets for interior lighting, window ports, and a high temperature pass-thru on the roof. The Issues: Concerns were raised as to the limited amount of spacing available for the desired enclosure. In addition, the placement of air vents must not interfere with control panel placement, door openings, or accessibility by personnel. The Design: The enclosure was designed to fit directly to the compressor skid base by easily accessible mounting holes. The cut-outs were carefully dimensioned and a template was used to lay out the pattern on the 12 Ga 304B Stainless Steel panel. 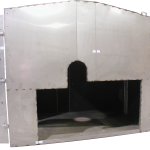 The Solution: The enclosure was custom fabricated and the desired attenuation was achieved to meet the customers requirements with test results supplied for validation, all prior to the desired due date. Upon arrival the enclosure was easily placed over-top the compressor package with no modifications being required. The customer’s response was so favorable to the first enclosure that additional orders have since been received for like enclosures.